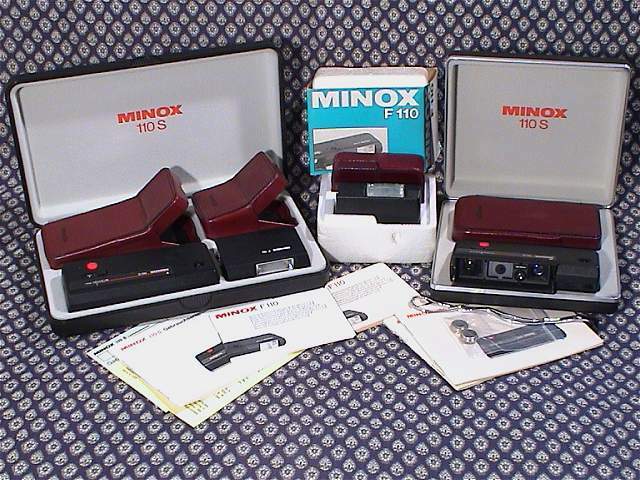 The Minox C was introduced in 1969 and the BL in 1972. Although sales in the US for the Minox C were good they did not meet the aspirations of Minox and the BL was not recognised, when it was released, for it value and sales were poor. So Minox looked to diversify. Two new lines of cameras were introduced in 1974, the Minox 35mm and the Minox 110S. The Minox 110S was not made by Minox, but was manufactured by Balda, who originally did all of Minox's plastic fabrication and who later marketed a range of 110 cameras themselves. What set the Minox 110S apart from the large number of 110 cameras are the range finder, parallax correction, outstanding lens and unique distance and depth of field scale on the top of the camera. They can be easily spotted by the set of "French-doors" that protect the lens, viewfinder and meter when closed and work as hood when open. The Minox 110S is made of matt black plastic (Makrolon?) but in a solid 5"x1"x2" 5 oz (131x26x54mm, 130g) block with smooth lines making it easy to slip in and out of a coat pocket. A lever on the bottom of the camera opens up the "French-doors" that protect the lens, viewfinder and meter. The depth of field scale on the top of the camera is coupled to the focusing scaling which can be set to display meters or feet and inches. Close focus to 60cm (2 feet) with parallax compensation in the viewfinder. The 25mm f2.8 (4 element in 3 groups) lens is considered as one of the top ten subminiature lenses by William White in Subminiature Photography. The lens Aperture can be set manually from f2.8 to f16 and automatically f2.8 to f22 with flash. The shutter release is locked if there is a used flash in the firing position. The matching electronic flash is attached to the side of the camera by a thumb screw and fixes the shutter speed to 1/40th second. Automatic electronic shutter with speeds ranging from 1/1000 to approximately 4 seconds. CdS meter provides aperture-priority automatic exposure control. Film speed is automatically set to 19DIN/64ASA and 27DIN/400ASA when 400 ASA cartridge is inserted. The viewfinder displays aperture and over-/under- exposure warning. The two Mallory MN625 batteries are inserted in the door. Original list price of nearly 300USD (street price 225USD). 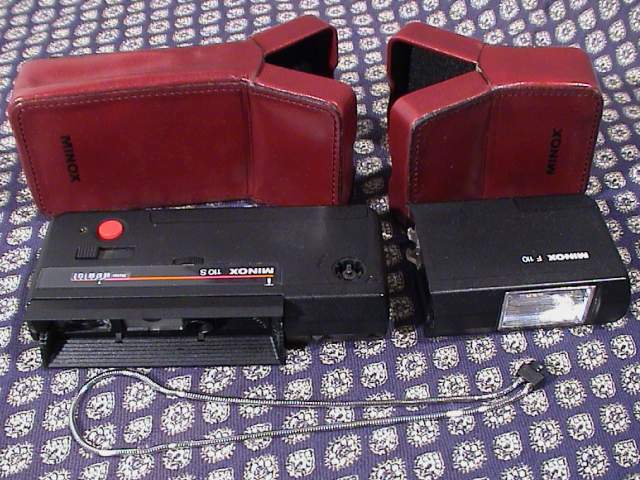 The camera was sold with hard case and also as a kit with the electronic flash and hard cases for both. There is also a dealer display transparent camera. Apparently it was never actually marketed by Minox, so the few prototypes made are sought by collectors. Made about 1974, it has a 25mm (f5.6), (3/3) scale-focusing lens, electronic shutter with speeds of 4 seconds - 1/1000. CdS meter provides semi-programmed exposure control. Tripod and cable release sockets.